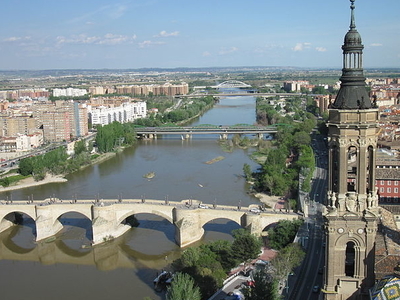 The Ebro is one of the most important rivers in the Iberian Peninsula. It is the biggest river by discharge volume in Spain.Its source is in Fontibre (Cantabria), from the Latin words Fontes Iberis, source of the Ebro. The upper Ebro rushes through rocky gorges in Burgos Province. Flowing roughly eastwards it begins forming a wider river valley when it reaches Navarre and La Rioja thanks to many tributaries flowing down from the Iberian System on one side, and the Navarre mountains and the western Pyrenees, on the other. The Ebro is the most important river in Spain in terms of length (928 km) and area of drainage basin (85,550 km²). However, the mean annual flow decreased by approximately 29% during the 20th century due to many causes: the construction of dams, the increasing demands for irrigation and the evaporation (higher than the rainfall, due to low rainfall, high sunshine and strong and dry winds) from reservoirs in the river basins. Here's the our members favorite photos of "Rivers in Region Of Aragon". Upload your photo of Ebro River! Lisa Mctigue is the only Touristlink member to visit Ebro River. Have you been here? Click here to save it.